During his travels in south India Sri Aadhi Sankaracharya, whom we shall refer to as Acharya Sankara, visited a village called Sri Bali (now called Shivalli) near Gokarn in Karnataka. In that village lived a wealthy Brahmin called Prabhakara. His only son was quite handsome in appearance but behaved like an idiot. He was aged thirteen but he did not talk to anyone, study anything or play with anybody and did not get even angry, when teased or hurt by others. Prabhakara performed the boy’s Upanayanam with great difficulty with the fond hope that this will at least bring about a change in the boy’s behaviour and attitude but that effort also failed as he continued as before only. He did not take to studying the Vedas as expected but continued to sit idle doing nothing as before. When Prabhakara learnt about Acharya Sankara’s visit, he went to see Acharya Sankara along with his son. Prostrating before Acharya, Prabhakara also made his son prostrate before him and narrated his problem, explaining that his son sat idly all through the day without reacting to anything. He prayed to Acharya Sankara that he bless his son and restore him to normalcy. Acharya Sankara looked at the boy straight in the eye and asked the boy ”Child, who are you? What is your name?” Prabhakara was surprised to see his son, who had been remaining silent upto now all his life, stare back straight at Acharya Sankara and pour out in reply twelve verses in chaste Sanskrit expounding the nature of his true self as eternal infinite consciousness. As the essence of Advaita Vedanta had been lucidly explained by the boy in these twelve verses making it as clear as a gooseberry in one’s palm, Acharya Sankara called the boy Hastamalaka; amalaka meaning gooseberry. 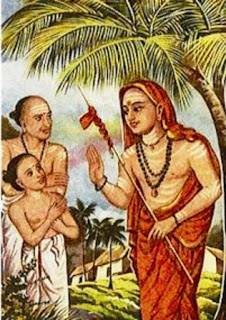 Acharya Sankara also wanted to give the boy sanyasa and take him as his disciple as he was not suited for the life of a householder and would fit in better as an ascetic in his entourage. Prabhakara willingly consented and Hasthamalaka joined Acharya’s entourage as a sanyasi. The twelve verses of his reply was known as Hasthamalakeeyam and had the distinction of being commented upon by Acharya Sankara himself. Hasthamalaka left with Acharya Sankara, accompanying him on his travels. He later became one of the four chief disciples of Sri Sankaracharya, the other three being Suresvaracharya, Padmapadacharya and Totakacharya. Later when Acharya Sankara established four Mutts in four corners of India i.e. at Joshimath near Badrinath in northern India, Sringeri in southern India, at Puri in eastern India and at Dwarka in western India, he placed Hasthamalaka now called Hasthamalakacharya in charge of Kalika Mutt at Dwaraka. But unlike Suresvaracharya and Padmapadacharya, Hastamalakacharya did not take to writing any Advaitic works or commentaries on other Advaitic works and he is revered more for himself only. In fact even earlier when he attended the classes held by the Acharya Sankara, it was more to verify his own experience than to gain proficiency in dialectics. It was suggested to the Acharya Sankara that, by reason of his realisation of the Self, Hastamalaka was pre-eminently competent to write a commentary on the Sutra Bhashya and should do so. Acharya Sankara negated the suggestion by pointing out that Hastamalaka’s plane of consciousness is different from rest and it always dwelt on the Higher Divine Self and he would not bring himself down to the mundane level to write books. Seeing Acharya Sankara placing him on a higher level than those engaged in dialectics, the other disciples were curious to know how one who was not known to have devoted any attention to learning the sastras could have attained the supreme realisation. Acharya Sankara explained to them Hasthamalaka’s background. On the bank of the Jamuna, a great sage was seated in contemplation when some brahmin girls came there to bathe. One of them had an year-old baby which she was carrying on hand. She placed the baby by the side of the sage and requested him to have an eye on the baby till she returned from bath and went to the river. The sage who was in a state of samadhi at that time saw nothing, heard nothing. The unattended toddler slowly crawled, entered the river and was drowned. The mother coming out of the bath was aghast. She took out the dead body of the child, placed it before the sage and wept bitterly. The sage, who had been in samadhi and quite oblivious to the happenings around him, was moved to pity for the grieving mother when he came out of his samadhi. Using his yogic powers, he left his saintly body and entered the body of the child. The dead child came to life, to the delight of its mother. That child is Hastamalaka, Acharya Sankara explained to reveal how Hasthamalaka came to have such a complete, comprehensive knowledge without any apparent instruction. The set of twelve verses in which Hasthamalakacharya gave his reply to Acharya Sankara’s initial question in their first meeting and is known as Hasthamalakeeyam, we shall see another time.